My favourite local celebrity couple finally announced to the public that they are engaged! Woot! They are a rebellious couple in so many ways. Doing their own thing to the beat of their own drum despite bashers and intrigues that didn't leave them for almost 7 years since their first TV show together. Marian is a rebellious woman. I've always found myself loving her because she's unafraid to be herself. And I always found myself rolling my eyes on the snooty people who looked down upon her just because she can't speak English based on Filipino society's "standards" whatever that even means. Who effin' cares?!?! She's part Spanish and part Cavitenia (did I spell that right) so she naturally has her own diction. But she's a college graduate, talented, beautiful, feisty, highly professional, and REAL. Qualities that are actually very rare in the industry. They also say she's a war freak--but people don't seem to even care to probe on her side of the story and always somehow opts to immediately believe the side of the other person involved. People love to hate her because I truly believe we have a crab mentality culture PERIOD. But I love her to bits. I'm happy that they are finally tying the knot. I already have my guesses on who the couple hired for the big day. Do you have guesses of your own? 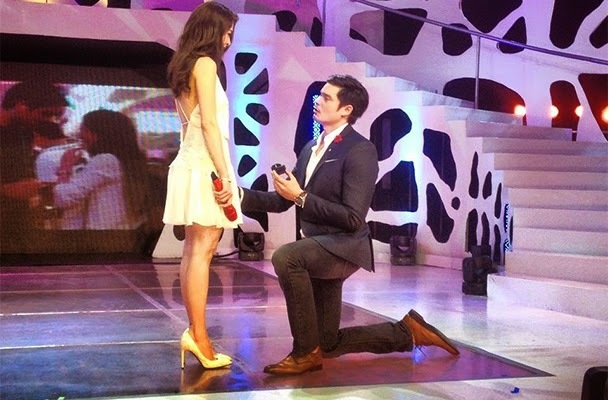 Who would be your "dream wedding team" for DongYan if you had it your way? Congrats to DongYan! And thank you for inspiring the nation with your rebel love.